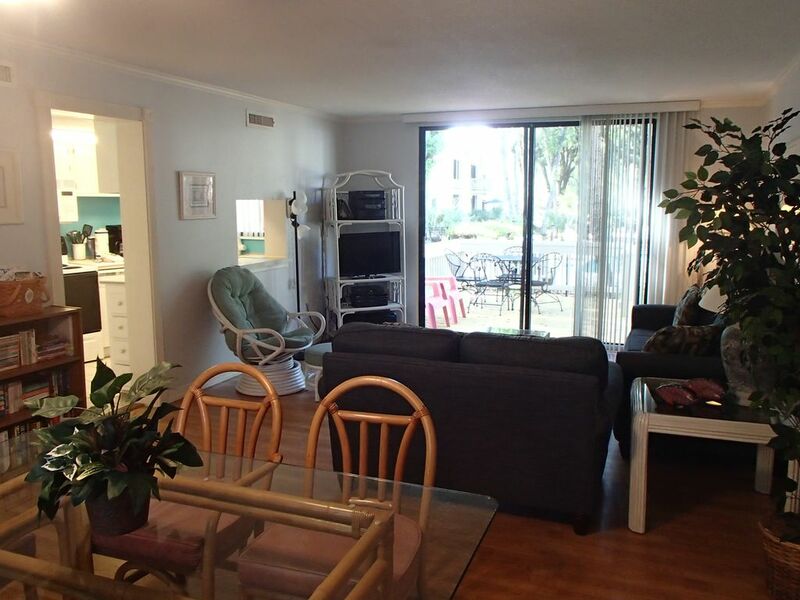 Lovely Seascape Villa, Steps to Beach&Pool (Frt of Complex)2BR/2Bth"SEE REVIEWS"
Welcome to our lovely 2 bedroom/2 bath NON-Smoking Villa at Seascape in the desirable South Forest Beach area. Seascape Villas are located in a Tropical Setting directly across the street from the beach. Our complex has a beach walk and a private locked beach cabana, with restrooms. Our unit is in the front of the complex (as close to the beach as possible)with only a three minute walk to the beach. Parking is right in front of unit. Seascape has two pools, walking and biking trails and play areas for children. Our unit backs to one of the pools. Our two bedroom, two bath unit has everything needed for a wonderful beach getaway. The lower level has a full kitchen, with a washer and dryer, living room with a sleeper sofa and a dining area. The kitchen is fully stocked with everything needed to make you feel at home. There is also a new deck off the living room that overlooks the pool. Now with free WiFi. Check out our reviews! We loved vacationing on HHI while renting in Seascape. It is the perfect tropical settting while being extremly close to the beach, restaurants & shopping at Coligny Circle. When a unit became availabe in the front of the complex with the pool right out the back door we couldn't resist. Wooden Deck is outside sliding door off the Family Room. You can watch your children swim while relaxing on the Deck! Right out the Back of our Unit! Seascape is a rather large townhouse complex directly across from the Grand Marriott in South Forest Beach, Our Unit #3014 is at the very front of the complex (closest to the beach).,The POOL is right out our back door., It is a great location! Perfect location to the beach and pool! Cute place. Thanks for your comments and for staying at our place. We look forward to having you come stay with us again. We just completed our fifth family vacation to Hilton Head Island in six years (May 2013, August 2014, August 2015, July/August 2017, and June 2018), all at the DeBartolo's Seascape Villas property. Tom is quick and responsive with all communication, whether the reservation, logistics, or questions or concerns. He has been timely with mailing the keys and parking pass, as well as returning the security deposit. This villa with two bedrooms, two bathrooms, full kitchen, and living/dining room has fulfilled the needs of our family with young children. The association maintains the Seascape Villas property. The community pool is about 25 steps off the back deck. It's approximately a five minute walk (herding children and carrying your beach gear) from the front door across the street and until your toes are in the ocean water. And the bike/run/walk pathway is right in front of the villa. It is significant to note that this villa is at the front of the property. A perk of staying in Seascapes Villas is access to the bathroom cabana at the beach. South Forest Beach drive is conveniently located between Sea Pines and Coligny Plaza Shopping Center. On our HHI vacations, we eat ice cream at Hilton Head Ice Cream on New Orleans Road, we rent and ride bicycles from Hilton Head Bicycle Company, I go for a run on the paths as well as the beach, my wife goes to yoga, we attend Holy Family Catholic Church on Pope Avenue, frequent Sea Pines for South Beach, Harbour Town, etc., walk around Coligny Plaza, listen to music and watch fireworks at Shelter Cove, shop at Tanger Outlets in Bluffton, and watch movies at Park Plaza Cinema on Office Park Road, etc. In summary, I do recommend Tom & Fiona DeBartolo’s vacation home, and we hope to be return soon. Thanks for stay with us year after year, we're glad you have enjoyed your stays and thanks for the wonderful review! The process with the owners was quick and easy. They communicated well. Reserved and confirmed quickly. Keys were sent about a week or so in advance. The condo overall was very good. The pool is literally steps off the back deck. The walkway to the beach is right out the front door. If you take much beach equipment you will want a cart. It’s not too far, but after dragging all the stuff the first day, I went and got a cart for the rest of the trip. The unit is only about 0.7 miles to dining and shopping in Coligny Park area, easy to walk there on the paths. Bedrooms are large; at the expense of the bathrooms. The bathrooms near the beach are extremely handy and makes staying “non-beachfront” a lesser issue. The size of the bathrooms is our only reason for not having a 5 star review. The hall bath is tiny. A 6’2” man and 4’8” boy shared this bathroom for the week. The boy begged to not shower there again as he hit his head several times during the first attempt. The shower stall is about 24” x 24” (estimated). It is very tight and a little claustrophobic. I had to move the trash can outside the bathroom to use the toilet. The sink is also small, but not bad for “the guys” as we don’t have much stuff to leave in the bathroom. The master bath is a little better. Full size tub/shower combo made bathing for “the girls” easier. Toilet is still tight (not as tight as hall bath). Sink is pedestal style with not a lot of storage. Some underneath storage and a medicine cabinet help mitigate that lack of storage. Plan on using the dresser in the bedroom as a staging area. Dining/living area is big and open. Laminate flooring throughout the main living area, with carpet up in the bedrooms. The owners provide an envelope to mail the keys back. That is very handy. They got them on Wednesday after we returned and we had our security deposit on the way back by Saturday. We’d definitely stay here again if we come back to Hilton Head. For the location, price, and conveniences we’re definitely able to handle the minor issues described above. Very nice vacation in a nice location. Thank you for the review, we look forward to having you come back to stay with us on your next visit to HHI ! Great place. Great location. Clean and well-stocked. Thanks for the review and for booking our condo. We would love to have you back in the future. Thanks so much for taking the time to leave a review. We are glad to hear you enjoyed your stay but are sorry to hear of your disappointment in not having a heated pool. To be clear we did not advertise in our listing that the pools in our complex are heated, perhaps you were thinking of a different listing? We really enjoyed the week. Will definitely be back! Thank you for taking the time to let us know how much you enjoyed your stay! We look forward to having you stay with us again. South Forest Beach, 75 yds to Atlantic Beach & Steps to Pool.